Even if you’re careful with your upholstered furniture and take good care of it, accidents can and do invariably happen. 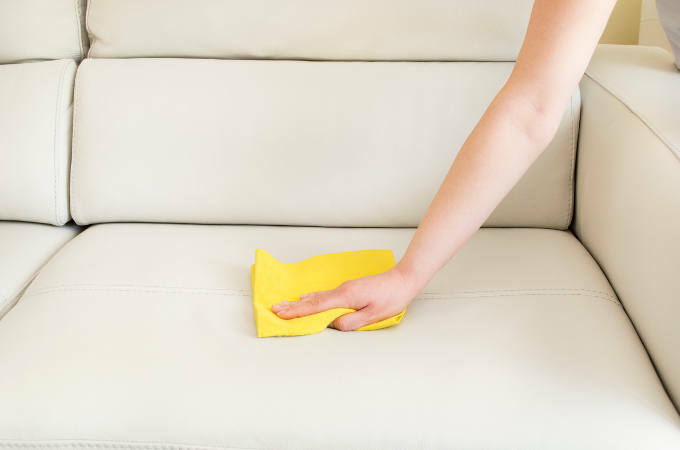 When you suddenly spot a fresh stain or watermark on a sofa or armchair, it can seem like the end of the world at first – but it doesn’t have to be. Here’s Apple Clean’s 4-Step Guide on how to remove a watermark stain on upholstered furniture, or at least reduce its appearance. Sanitising the affected area carefully before you start the cleaning process should be the first step. Give it a thorough hoover to remove any dust or food particles, dry skin residue, pet hairs etc, and ideally use a lint roller as well to make sure everything is completely clean. Obviously, you should first check that the material is suitable for vacuum cleaning, so as not to cause any damage to delicate fabrics. Once the area is as clean as possible, you can start to tackle the watermark stain. Take a soft cloth dampened in cold water and start to gently dab and rub at the stain. Work slowly and carefully and always according to the manufacturers’ instructions – there should be a care label on the furniture. While some fabrics are more hardwearing than others, it’s best to be gentle, particularly if you’re dealing with watermarks as opposed to other types of stain removal. Dab and rub gently and in a circular motion, working from the outside of the water stain, towards the centre. That way, you will stop the stain from spreading further, concentrating your cleaning efforts around the original watermark. If all you are trying to remove is a watermark as opposed to cleaning up a stain, clean water may be all you need. Once the cleaning process is complete, take a stack of paper towels and place them on top of the wetted area. Put something heavy, say 2-3 hardback books, on top or press down firmly with your hands, to apply pressure. When most of the moisture has been absorbed from the freshly cleaned fabric, use a hairdryer on a cold setting to dry the area off completely. In case the watermark hasn’t completely gone, remoisten the area and repeat the process. With care, time and patience, it should come out. At Apple Clean, we offer a range of professional upholstery cleaning services to ensure that your home stays hygienically clean and looking fresh at all times. Our experienced team of operatives can deal with watermarks and stain removal on three piece suites, settees, armchairs and any other upholstered furniture. If you’re struggling to remove a stain or watermark yourself, or would rather not have a go yourself and let a professional deal with it, give us a call today on 0800 587 4571.